Hi, I have small collection of tabletop pinballs that I want to share with you and also ask you, what else do you know that exists simillar to this? If you know about something that is not listed here, please let me know in this thread. I have never ever played the big table pinball. But I am really fascinating of it. I live in country where are maybe 5 people in whole country who is collecting pinballs. I also never see a pinball in bars. Somewhere it should be but I do not have luck to see one. My dream is to buy one from year 1992+, but even very used (which means about 1500€ minimum) is too expensive to me and in my actuall financial situation it will be expensive for decades. So only what I am able to buy are toys. 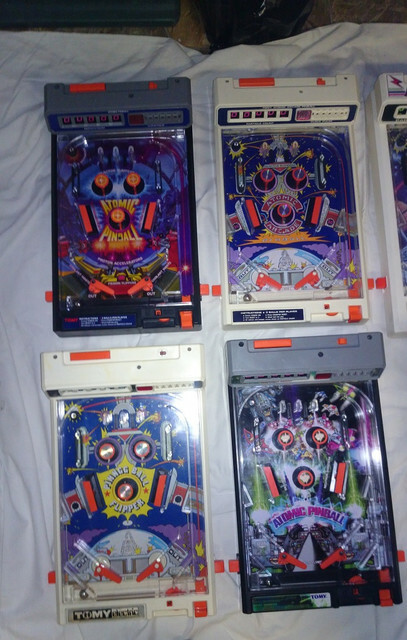 And maybe it will be interesting also for you to see what else exists beside reall big table pinballs. The most common is Tomy Atomic Pinball. Very nice thing and very good play. You can find videos about it. It has few different backgrounds. Very simmillar but with more sound effects is Atom pinball. And it is slightly longer. 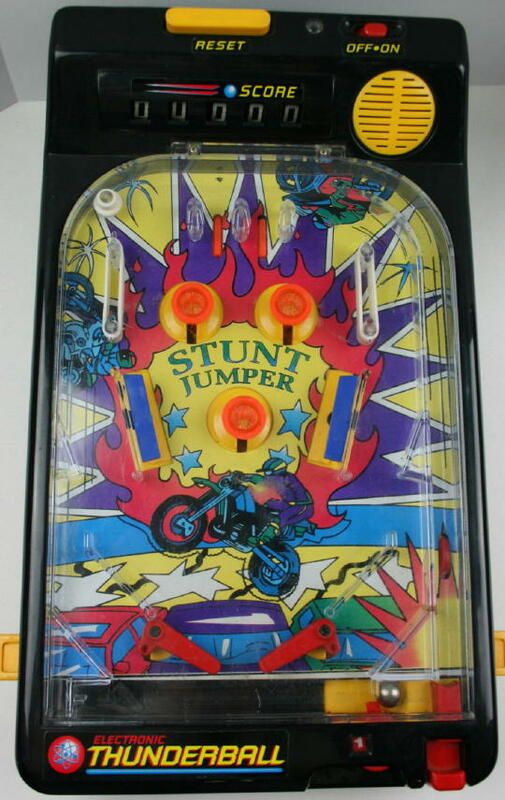 There is also this variation: Stunt Jumper Thunderball Pinball. It has lights on working bumpers. Also you can find video of it. I do not have this one. Still searching for it. One more variation I know about but also do not have. 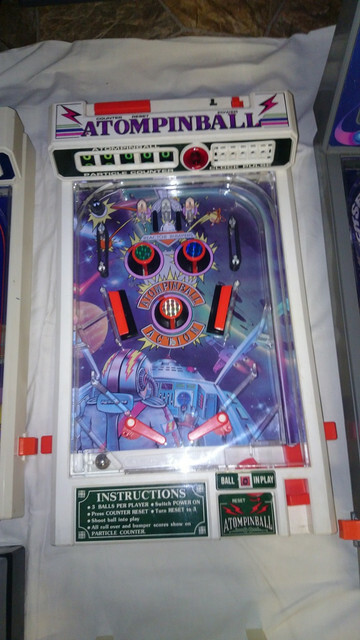 The next one and probably the best tabletop pinball is Tomy Astroshooter. It is bigger than Atomic. There are more art variations like American pinball or Coca-Cola. But playfield is everytime same. I have only one of theese. 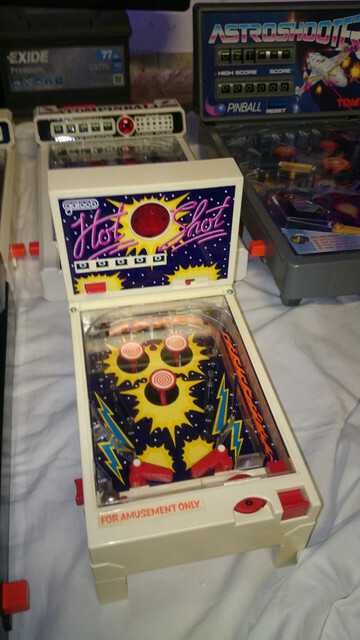 Last one I have is Galoob HotShot Pinball. It turned out that it is really rare. It is very small, the smallest one, and still it has reall bumper action and also reall bell. I have made a video of it.